Korea, traditionally known as the �Land of the Morning Calm,� is today a modern, bustling hub of East Asia. 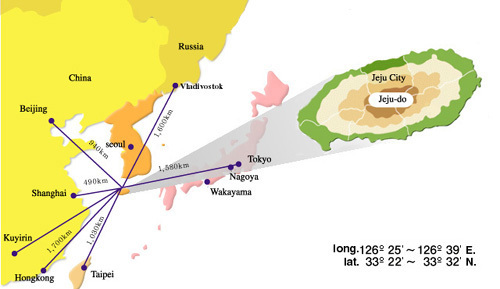 It is a peninsula jutting off of China, and Japan is only two hours away. Despite this close physical proximity to the neighboring countries, Korea has a distinctive culture of its own, which has developed during its 5,000 years of history. The 2002 World Cup Korea/Japan attracted attention from the international community because it was the first to be held in Asia and to be staged by two countries. 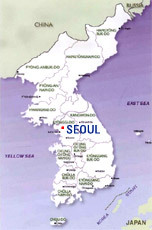 Seoul, the capital of the Republic of Korea, is one of the ten largest cities in the world with a population of over 11 million people living on about 628 square kilometers. The city nestles between two mountain ranges. 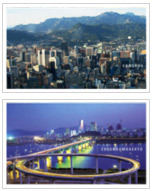 The Han River flows west to the Yellow Sea and divides the city into two parts. A distinctive characteristic of Seoul is the remarkable ways of yesterday and today blended and its balance to preserve all that is the best in Korea's unique 5,000-year culture. Today, Seoul is the center of the nation's government, education, business, finance, entertainment, art, industry and administration. Jeju-do or Jeju Island is one of the nine provinces of Korea and it is only an hour�s flight south of Seoul. There are direct flights from Tokyo, Osaka, Nagoya, Fukuoka, Shanghai and Hong Kong. As a result of its isolated location and romantic tropical image, Jeju-do has become a favorite retreat with honeymooners and tourists. The island has a mild marine climate. It has four distinct seasons and an average yearly temperature of 15C. The island is 73 km wide and 41 km long with a total area of 1,845 km2. Jeju Island, the largest island in Korea, came into existence 700 to 1,200 thousand years ago when lava spewed from a sub-sea volcano and surfaced above the waters. Then 100 to 300 thousand years ago another volcanic eruption that formed Mt. Halla, which is South Korea�s highest peak. The island offers visitors a wide range of activities: hiking on Mt. Halla, catching sunrises and sunsets over the ocean, viewing majestic waterfalls, riding horses, or just lying around on the sandy beaches. The Korean Won is the unit of Korean currency. USD $1 is about KRW 1,027 as of April 2005 Credit cards, e.g. VISA, Master Card, American Express and Diners Club, are widely accepted in most restaurants and hotels. Outlets for 220 Volts are commonly available in hotels and other facilities in Korea. Please check the power supply before using equipment. Foreigners wishing to visit the Republic of Korea should obtain a valid passport. Visitors with confirmed round-tickets can stay for 30days without visas. However, visitors from some countries should obtain an entry visa before coming to Korea. When uncertain as to the requirement for entry visa to Korea, please contact the Korean embassy or a consulate as early as possible. If you are in need of an individual invitation to the IJCNLP-05, please contact the secretariat.